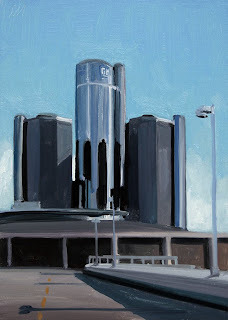 General Motors Building, oil on linen panel, 7"x5"
The General Motors Headquarters building on the Detroit River with sunny skies. Yesterdays Detroit Free Press headline read: 19,000 READY TO LEAVE GM. Another sad day for GM, Detroit and Michigan. 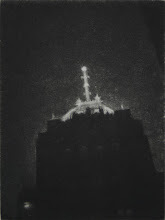 The Detroit Alphabet "N", oil on linen panel, 7"x5"
Neon letter "N" along Woodward Ave.
Michigan Palace Theatre, detail, oil on linen panel, 7"x5"
Empire State Building Nocturne, oil on linen panel, 7"x5"
We are back in Detroit after a long evening, we sat on the tarmac at La Guardia for almost 4 hours waiting for storms to pass. This post is my way of saying good night New York. Tomorrow I will be back posting Detroit images. The New York images have been received very well and I may continue to do a few along with the Detroit images. We have been subletting the same loft in lower Manhattan now for 15 years and it is like our home away from home. Our trip was very successful, we saw friends, lots of art and shot lots of photo ref and walked and walked and walked. It will take a few days for our feet to recover. 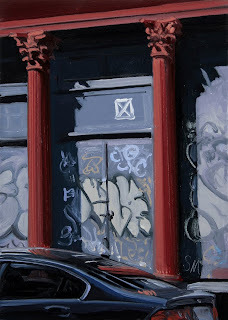 Howard Street Tags, oil on linen panel, 7"x5"
Howard Street is one of my favorites, it is only about four blocks long, and has some of my favorite buildings. This one dates to before the Civil War. It is almost always covered with graffiti and tags, which I find very interesting. The daily stimulation one is bombarded with is overwhelming. I will see more in one block of NY than I see in a month in Detroit. 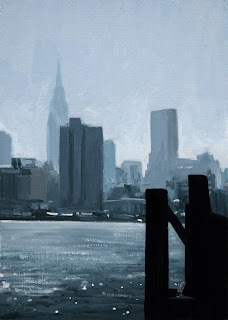 Tomorrow will be the last of the NY paintings for now. 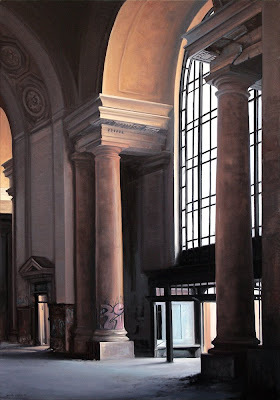 There has been very good response to them so I may do more in the future and maybe start a second blog with NY paintings and photos of NY graffiti. 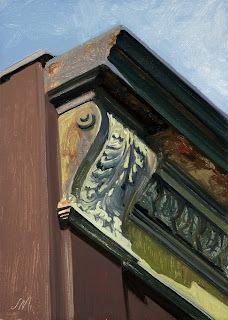 Chelsea Detail, oil on linen panel, 7"x5"
Artist Mark Oberndorf shooting photos. Yesterday we had a studio visit from Artist Mark Oberndorf. After the studio visit and lunch, Mark, Janet and I spent the afternoon in SOHO and the West Village taking photographs and talking art. A great way to spend the day. 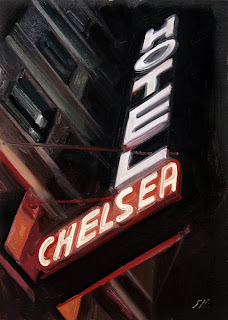 The Chelsea Hotel, oil on linen panel, 7"x5"
The famous Chelsea Hotel at night. 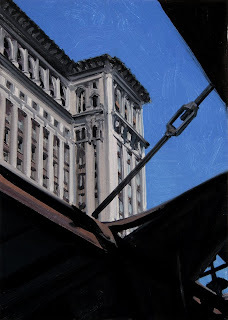 The "A" Train, oil on linen panel, 7"x5"
Had to take the A train uptown to shoot photos for a commission. Mass transportation is so wonderful, the lack of a transet system really handicaps the growth of Detroit. 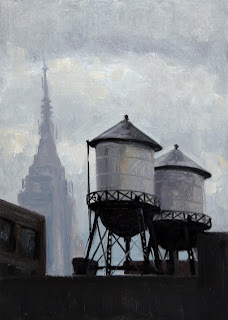 Chelsea Tanks & ESB, oil on linen panel, 7"x5"
This view is from the ninth floor in one of the Chelsea Gallery district buildings, The George Billis Gallery was in this building before moving to the ground floor on 25th st.
New York Skyline, oil on linen panel, 7"x5"
This is the fifth of the New York paintings. 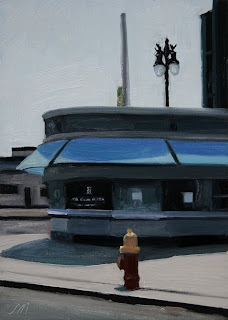 Broadway Reflections, detail, oil on linen panel, 7"x5"
This is the fourth of the New York paintings. 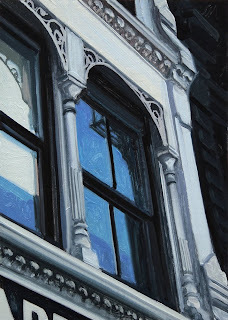 A detail of the reflections on a window on Broadway. 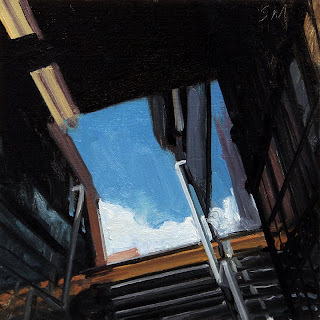 Spring Street Subway Station, oil on linen panel, 5"x5"
This is the third of the New York paintings. A couple shots of friends, family, and peers at the opening. 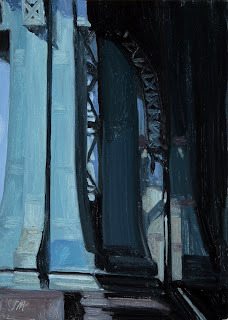 Manhattan Bridge, detail, oil on linen panel, 7"x5"
This is the second of the New York paintings. A detail of the base of the Manhattan Bridge. Some installation shots of the David Klein Gallery show. 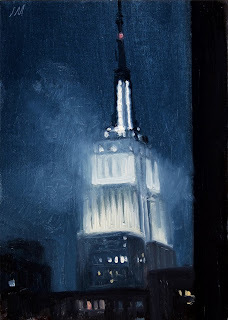 Empire State Building at dusk, oil on linen panel, 7"x5"
This is the first of the New York paintings. We will be in NYC for ten days and I will try to post as many days as I can. 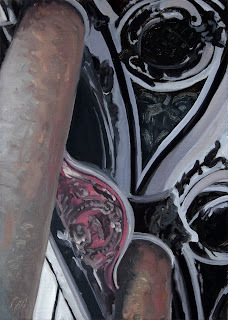 I will also be posting some photos from the opening as soon as I can get my act together. Thanks to all that have inquired. 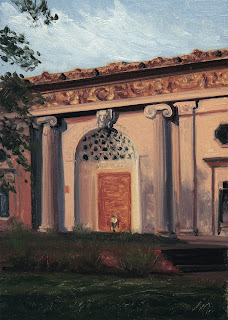 Michigan Central#3, oil on linen panel, 7"x5"
I missed posting this one because of travel time to New York. Another in the Mi Central series. 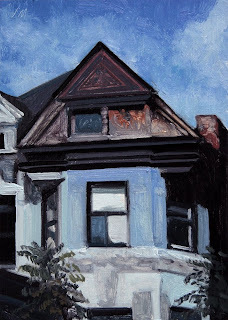 Mi Central #2, oil on linen panel, 7"x5"
The Blue House, oil on linen panel, 7"x5"
So many wonderful shades of blue on this house and sky. 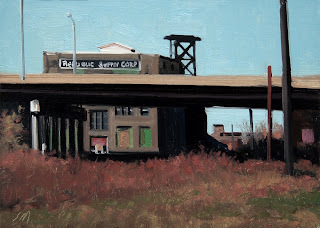 RR Bridge at Woodward Ave, oil on linen panel, 7"x5"
Detroit Blues, oil on linen panel, 7"x5"
Corner industrial building on John R.
SOLDoil on linen panel, 7"x5"
Jimi's Ice Cream Pallis is down the street from the studio we had in Royal Oak. They opened for the season last week. 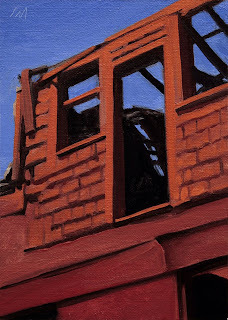 Project Orange Detail, oil on linen panel, 7"x5"
A detail of one of the Project Orange buildings against a deep blue sky. 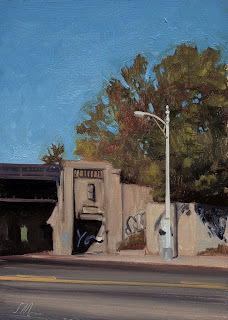 Urban landscape with bridge and shadows. This is in Hamtramck. 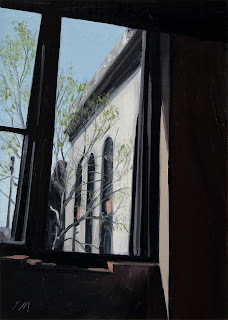 For those in the area, my show at the David Klein Gallery opens today, Saturday May 10, 5-8, please stop by. 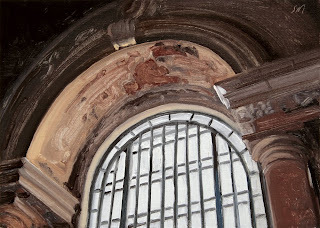 Michigan Central, Detail#2, oil on linen panel, 5"x7"
Another in the Michigan Central Depot series, I wanted to use the palette from the large Mi Central painting before it dried up. This is the window and arch for the main entrance to the station. 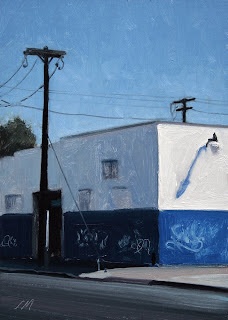 For those in the area, my show at the David Klein Gallery opens tomorrow, Saturday May 10, 5-8, please stop by. 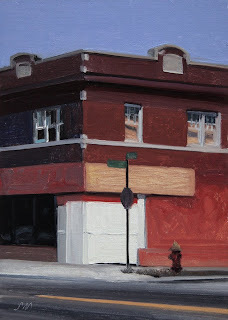 John R & Montana, oil on linen panel, 7"x5"
Beautiful corner storefront at John R & Montana St.
at the David Klein Gallery. 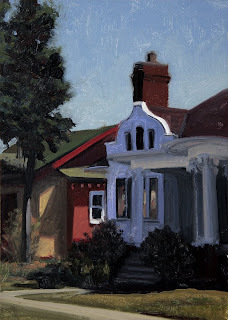 House in Shadow, oil on linen panel, 7"x5"
I could not resist these two beauties. 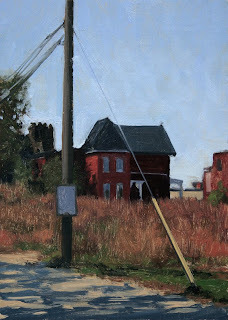 McGregor Public Library, oil on linen panel, 7"x5"
I really liked the shadows and the sense of rural and urban in this Brush Park scene. Feels like a country road in the heart of the city. 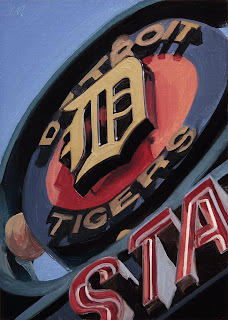 Detroit Tigers Stadium#2, oil on linen panel, 7"x5"
A detail of the old Detroit Tigers Stadium Ticket stand, the stadium isno longer used by the Tigers. It is to be torn down within the next month. Second in the Tiger Stadium series. 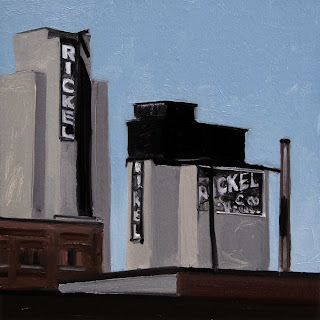 Rickel Malt II, Detail, oil on linen panel, 5"x5"
The Rickel Malt buildings near Gratiot Ave. These are no longer standing. 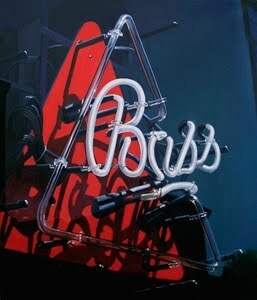 Rickel supplied the local Stroh Brewery with malt for making beer. 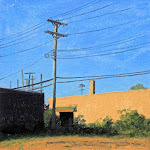 Detroit Tigers Stadium, Detail, oil on linen panel, 7"x5"
A detail of the old Detroit Tigers Stadium, no longer used by the Tigers. It is to be torn down within the next month. 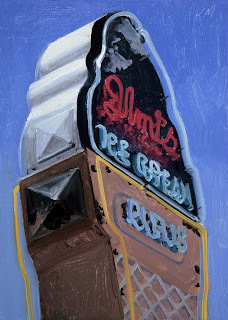 I may do a series of paintings of the exterior detalis. 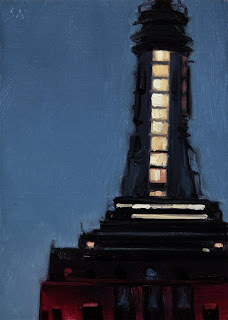 Fisher Building Nocturne, oil on linen panel, 7"x5"
The third Fisher Building nocturne. 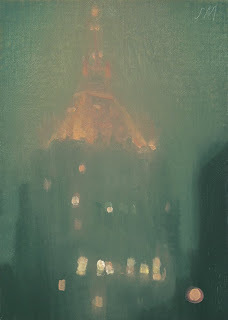 We were returning from the opening at Alley Culture and this was the view of the Fisher Building.